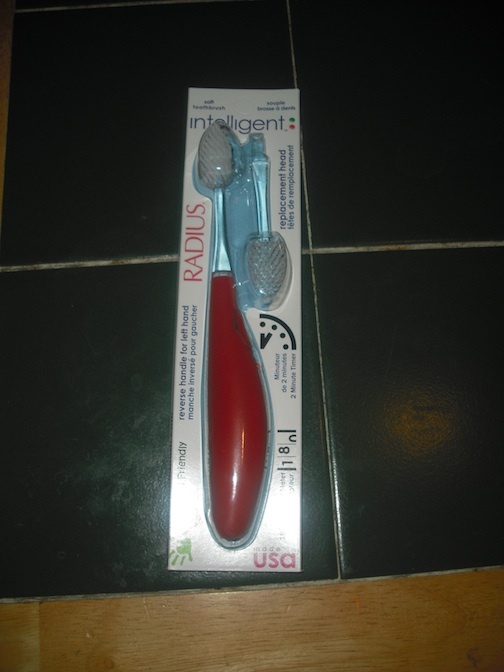 REVIEW AND GIVEAWAY - Radius Intelligent Toothbrush - Mom Knows It All. Having been to the dentist in the last two weeks I’d like to remind you of how important good tooth care and oral hygiene is. I was glad to hear that I did not have any cavities. I was not so glad to hear that the dentist wanted me to have gum work done AGAIN. I brush several times a day and floss. The Radius toothbrush that arrived for me to review couldn’t have come at a better time. The Radius Intelligent Toothbrush has a built in timer that will alert the user in thirty second intervals. I have not been brushing that long so this will be a good tool for someone like me, as well as children who need to learn how to brush correctly. I absolutely love the handle on this toothbrush, it’s solid, non-slip handle is very comfy to hold and can be used by righties and lefties alike. The head is cool, it has 65% more bristles than your typical toothbrush. I found that the head seemed to be covering more and I felt like I was doing a better job. As a person who’s used a toothbrush longer than the recommended time I appreciate the built in 3 month wear meter that tells the user when it’s time to replace the head. Oh yes, didn’t I mention that? The head is replaceable! No more buying new toothbrushes, which saves money and reduces waste. Just pop a new head on the reusable handle and you’re good to go. The Radius Intelligent Toothbrush is available with soft or medium bristles and is available to purchase online. An individual toothbrush is $8.99, a three pack $24.27 and a six pack $43.15. A two pack of replacement heads is $5.49. ONE winner will receive a Radius Intelligent Toothbrush. To enter visit the Radius Toothbrush site and then leave a comment on this post telling me which of their products you’d most like to try. US addresses only please, no PO Boxes. This contest will end on Friday 07/23/10 at 11:59 pm est. If you’ve entered any of my giveaways before then you know that only comments containing all of the requested information will be eligible for entry. The winner must contact me to confirm they wish to receive the prize within two days of my email notifying them they’ve won. Good luck to everyone! I would like to try the pink Scuba. I’d love to try the Source – Handle lasts forever! The size of the head seems intimidating for small mouths. I’d like to try the Cranberry Coated Floss. Thanks for the review and giveaway! I would like to try the scuba toothbrush. The Kidz toothbrush is great. I’d like to try the Scuba toothbrush.